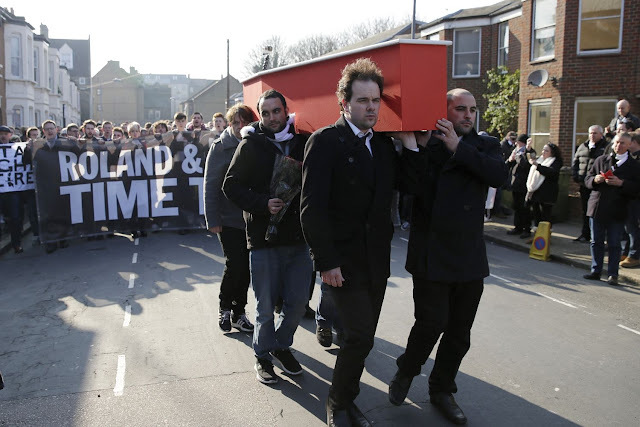 Dismayed at the shambolic running of their club by Belgian owner Roland Duchatelet, Charlton fans showed their displeasure on Sunday by staging a mock funeral. The club are currently on the verge of tumbling into League One and are the latest club to feel dumped on by what they feel are negligent or dishonest owners. 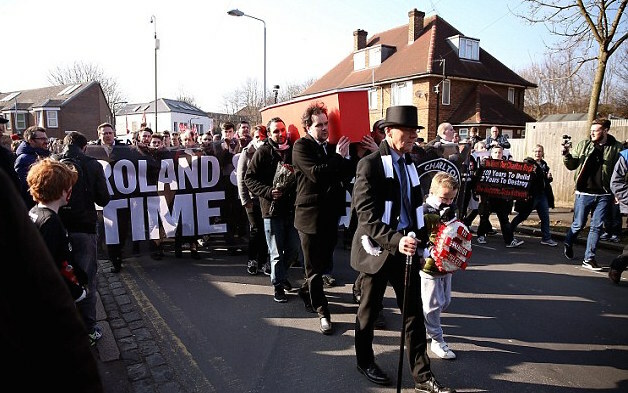 Irate by the state of affairs at the club and compounded by the fact that Charlton's own Chief Executive openly complained that supporters need to accept that they are customers, fans followed up their funeral procession by chucking beach balls on the pitch during their 2-0 win over Middlesbrough and then staging a mass walkout on 74 minutes. The 74th minute mark was chosen to mark the 74 goals the club has conceded so far this season. The actions of Addicks supporters has not gone unnoticed by the British and International media, but will it be enough to put pressure on their current owners to sell the club? Does any sort of protest action short of not renewing your season tickets or giving a club any of your hard earned money, while also pressuring sponsors have any effect? Unfortunately Charlton aren't the only club with recent Premier League pedigree that are in trouble. Leeds United, currently in 13th place in the Championship, are still under the control of controversial owner Massimo Cellino and are being led from the touch line by unpopular manager Steve Evans. 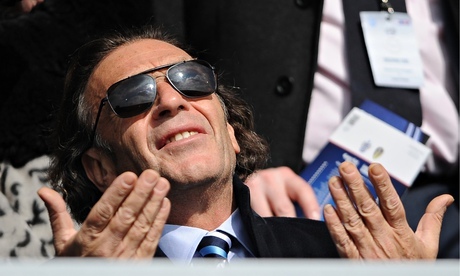 Cellino was in the news again last week when his sons took to social media to abuse Leeds fans. His son Ercole called one woman a "whale" and then later claimed that his English led him to not understanding the offence that could cause. Meanwhile Bolton Wanders, a club who were a tough to beat mid-table Premier League side a decade ago, are nearly £200million in debt and seemingly headed towards the third tier. Finally, another Championship struggler, Nottingham Forest, have found themselves only nine points above the relegation zone after losing five of their last six matches. Manager Dougie Freedman was sacked on Sunday, and Forest supporters like those of Charlton, Leeds and Bolton were left wondering how their club has been so horribly mismanaged, and what, if anything, they can do about it.